The "Group of 20" (G20) is made up of the finance ministers and central bank governors of 19 countries and the European Union: Argentina, Australia, Brazil, Canada, China, France, Germany, India, Indonesia, Italy, Japan, Mexico, Russia, Saudi Arabia, South Africa, Republic of Korea, Turkey, United Kingdom and United States of America. The G20 meets regularly to discuss matters of common interest. As a result of the global financial crisis, the G20 began to explore ways to improve the global financial system, including regulations related to financial reporting and institutions. The G20 has for some time called for the global convergence of accounting standards and has supported the IASB-FASB convergence process. In the context of the 2018 G20 Buenos Aires summit, the Financial Stability Board has released its fourth annual report on the implementation and effects of the G20 financial regulatory reforms and a letter by the FSB Chair to the G20 Leaders. A summary of recent developments at We Mean Business, WBCSD and SASB. The Financial Stability Board (FSB) has published for consultation the main elements of a proposed framework for post-implementation evaluation of the effects of the G20 financial regulatory reforms. In a letter to the G20 Finance Ministers and Central Bank Governors who met in Baden-Baden, Germany, on 17-18 March 2017, the Financial Stability Board (FSB) also identified new and emerging vulnerabilities that need to be adressed. Ahead of the Group of Twenty (G20) meeting in China on 4-5 September 2016, the Financial Stability Board (FSB) has published a report on the 'Implementation and Effects of the G20 Financial Regulatory Reforms'. The report also briefly considers international accounting convergence, especially as regards expected loan loss provisioning. The International Federation of Accountants (IFAC) has issued a letter to the G-20 outlining eight recommendations for the G-20 to consider at the G-20 Leader’s Summit on 15-16 November 2014. The recommendations focus on supporting economic growth and a resilient economy as well as addressing financial regulatory reform and the international taxation system. They include the adoption and implementation of IFRSs. The Financial Stability Board (FSB) has published a report to the G20 Finance Ministers and Central Bank Governors on financial regulatory factors affecting the supply of long-term investment finance. The report provides an update on the FSB's ongoing monitoring efforts around this issue and summarises a survey of FSB members, continued engagement with practitioners in long-term finance from the private sector, consultation with FSB Regional Consultative Groups (RCGs), and work by the FSB Secretariat together with the staff of the IMF, World Bank and OECD. In light of the importance of infrastructure and other long-term investment for the global economy, the B20 forum through which the private sector produces policy recommendations for the Group of 20 (G20) leaders created a taskforce, which developed actionable recommendations for the G20. As a result of one of these recommendations, the six largest international accounting networks formed a panel to analyse existing accounting and corporate reporting practices and suggest improvements. The panel has now published a report focussing on whether improvements in accounting and corporate reporting could help to attract increased private financing by offering a broader, longer-term perspective on shareholder value creation. Over past years, the G20 used to call for convergence of accounting standards in the final communiqués published after their summits. The newest communiqué published after the meeting of G20 Finance Ministers and Central Bank Governors in Sydney does not contain a call for converged accounting standards anymore. The Organisation for Economic Co-operation and Development (OECD) has released a summary of issues associated with country-by-country reporting by taxpayers responding to a particular aspect of a joint G20/OCED project investigating the fairness and integrity of global tax systems. The report follows the endorsement by the G20 of the OECD 'Action Plan on Base Erosion and Profit Shifting' (BEPS), the outcomes of which are aimed to be implemented by the end of 2015. The summary of issues explores various considerations arising in developing an internationally accepted and applied 'template' for country-by-country reporting as a part of transfer pricing documentation, and considers accounting requirements and other information as the base for the information which might be included in the template. 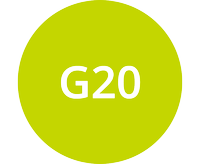 The Group of 20 (G20) has released its G20 Leaders' Declaration and accompanying documents from the G20 Leaders' summit held in St. Petersburg on 5-6 September 2013. Focused on the theme of "cooperation, coordination and confidence", which aims for a stronger and sustainable growth to end the global financial crisis, the Declaration also discusses again the need for convergence of accounting standards. In preparation for the upcoming G20 Leaders' Summit, the Financial Stability Board (FSB) has released several reports about progress in connection with the fundamental reform of the global financial system initiated by the G20 in 2008. One of the developments that is facing 'difficulties in meeting its objective and/or timeline' is achieving a single set of high quality global accounting standards. In a joint letter to the 28 EU Heads of State and Government, European Commission President José Manuel Barroso and European Council President Herman Van Rompuy inform about the key issues coming up for discussions at the G20 summit in Saint Petersburg on 5-6 September 2013 and call on fellow G20 leaders to unite around a common purpose to improve global confidence and support the global recovery. The communiqué from meeting of the G20 Finance Ministers and Central Bank Governors held in Moscow on 19-20 July 2013 reiterates the call for the finalisation of the joint IASB and FASB projects. The European Commissioner for Internal Market and Services, Michel Barnier, spoke at the Global conference on sustainability and reporting in Amsterdam which also saw the launch of the new G4 guidelines developed by the Global Reporting Initiative (GRI). Barnier highlighted the measures taken by the Commission to promote long-termism in the corporate sector which also include a recent proposal on non-financial reporting. The communiqué from meeting of the G20 Finance Ministers and Central Bank Governors held in Washington on 18-19 April 2013 reiterates the call for the finalisation of the joint IASB and FASB projects. The European Market Infrastructure Regulation (EMIR) was passed in 2012, but most provisions only apply after technical standards enter into force. Technical standards on OTC derivatives, reporting to trade repositories and requirements for trade repositories and central counterparties entered into force on 15 March 2013. EMIR gave rise to the IASB's project on the novation of derivatives as EMIR brings about hedge accounting questions. The International Accounting Standards Board (IASB) has issued ED/2013/2 'Novation of Derivatives and Continuation of Hedge Accounting'. The exposure draft proposes changes to IAS 39 and the forthcoming hedge accounting chapter of IFRS 9 to permit the continuation of hedge accounting where hedging instruments are novated to a central counterparty in accordance with laws or regulations introduced by jurisdictions to implement the G20's agreed reforms around over the counter (OTC) derivatives. As a number of jurisdictions are currently considering implementing these laws, the IASB is proposing an urgent amendment and has set a 30 day comment period. The Communiqué from meeting of the G20 Finance Ministers and Central Bank Governors held in Moscow on 15-16 February 2013 expresses 'concern' about the delay in the convergence of accounting standards, and also calls for improvements in public sector reporting. IASB Chairman Hans Hoogervorst has discussed a broad range of issues over recent days. Key themes emerging include challenges in some of the IASB projects such as leases with its lobbying efforts against the proposals, global adoption of IFRS including in the United States, accountability arrangements for standard setting and future priorities, including the possibility of revisiting the accounting for goodwill. A communiqué has been released outlining the outcomes of a meeting of the Ministers of Finance and Central Bank Governors of the Group of 20 (G20), which was held in Mexico City on 4-5 November 2012. The communiqué notes 'concern about the slow progress achieved toward a single set of high quality accounting standards'. The Group of 20 (G20) has released a Leaders Declaration and supporting documents from the G20 Leaders Summit held in Los Cabos, Mexico on 18-19 June 2012. The declaration includes reference to convergence of accounting standards, and reaffirming a commitment to sustainable development at the 2012 United Nations Conference on Sustainable Development (Rio+20), which may endorse sustainability reporting.